Spring Cleaning: Thank Goodness for the Pros! I’ve been thinking a lot lately about the many aspects of spring cleaning – the clearing away of every kind of debris that clutters up our lives and drains our energy. The first day of spring brings up images of yellow forsythia in bloom, the fresh sound of rivulets and streams, and the hope of fresh starts. It can also bring up discouragement if you are feeling overwhelmed by the daily household chores that sometimes pile up to an alarming degree. It’s okay to hire help! I have been there myself and am so grateful for the day we decided to engage a cleaning person twice a month. If you too have had the gift of an angel helper in your home, you can share the gratitude and help me acknowledge the value of this under-estimated group of professionals. When we moved to our new city, we had to find a new cleaning service and with the usual synchronicity (miracle) Lindsay appeared. Besides the regular biweekly tidy and clean, she has helped us learn about our neighbourhood, checks the house when we are away, and has been indispensable for all kinds of situations with mail, keys, or guests arriving early. Texting is our ongoing line of communication for professional and personal talks. We trust her completely, and enjoy her company when we are home when she comes. The question of cost is no small matter for some, but if you don’t already know the benefits, you might like to give it a go. I for one would give up lots of things before I’d let our cleaning angel go. Besides the sheer pleasure of a cleaner house, in a time when many of us barely know our neighbours and with family members often far away, a relationship like this can bring a lot of harmony and freedom to overloaded lives. Thank you to all the cleaning professionals out there! Be open to the signs, because you never know when spirit is going to send you a wee blessing that will turn your day around. On the morning of April 9 the snow banks were still high and I was pretty low when I went out on the front veranda to ask for a glimmer of cheer. 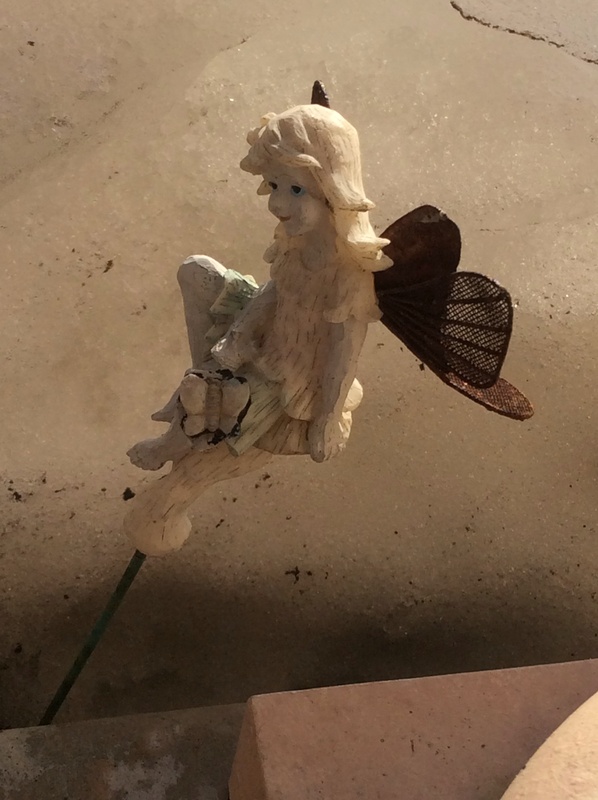 There she was less than four inches small, a tiny garden fairy/angel that I hadn’t noticed in the fall when we moved in, appearing out of the dirty snow bank — and with a butterfly on her knee just in case I needed a stronger symbol of hope. I immediately felt a shimmer go through my body and my eyes filled with tears at the sight of this simple sign of hope and renewal.